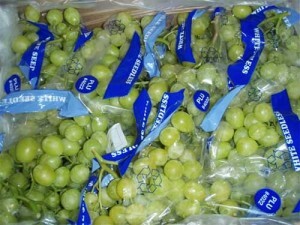 The USDA is currently revising the US Grades for Table Grapes. Currently, the U.S. No. 1 Table Grade allows the following defects at market (destination). The proposed standard will allow an additional 5% for shattered berries, for grapes packed in bags. Is this allowance too much? Table Grapes could now have 17% shattered berries and still make grade. That is equal to about 3 pounds of loose or shattered grapes in an 18 pound container. Some people say shattered grapes are more susceptible to decay, while others say the loose grapes are still in the bag, the consumer is buying. WOW! 17% defects sounds like an awful lot to be allowed. Won’t this lower the quality of the product and in essence drop the prices across the board? In other words, won’t the grapes with 2 to 3% shatter be hurt by grapes still grading U.S. No. 1 but having 15% or more shatter? I suppose only allowing an additional 5% for shattered berries is better than the original proposal of allowing 10%. When is the ruling going to be official? I would think the shattered berries would be more prone to decay. But a shattered berry that has decay is scored against the decay tolerance, correct? The talk of adding an aditional 5% tolerance for Shattered Berries in the Table Grape Standard is crazy. Leave it alone. It just seems that over the past 30 years I’ve seen less shattered berries in film bags than in loose packed bunches. It seems the the stems don’t dry out as fast or they are not stored as long. Let’s subtract 5% from the tolerance.